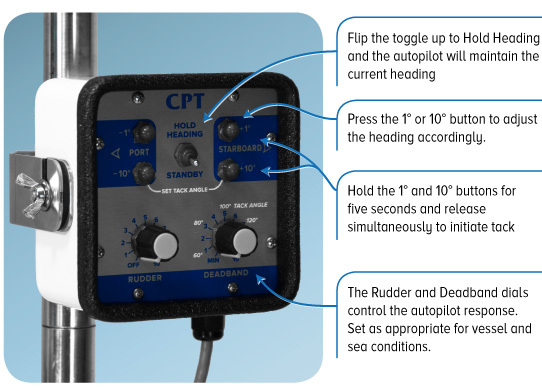 Features of the CPT Autopilot - CPT Autopilot Inc. 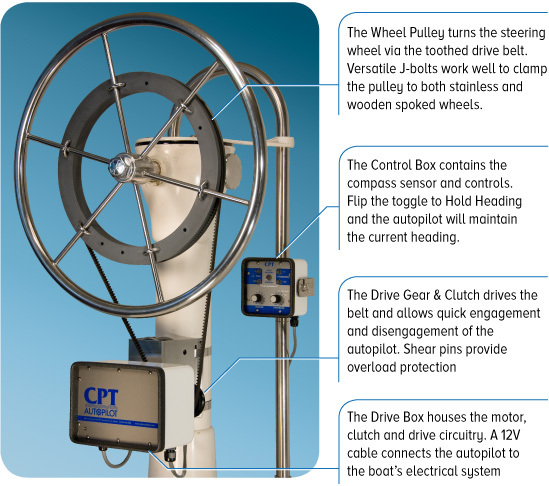 The CPT is constructed ruggedly for a long life in the marine environment. It uses an electronic heading sensor, capable of operating at up to 45 degrees of tilt. The CPT sensor responds quickly and works reliably in the cockpit. The strength of the CPT comes from the size of its motor and gearing. The robust motor of the CPT produces high torque and rpm at the wheel, allowing it to respond fast with torque to spare. Because of the speed of its motor, the CPT can handle large boats with hydraulic steering, which can have many turns lock to lock. A common complaint amongst owners of more powerful under deck models is the constant “groaning” as the pilot works to keep the boat on course. The CPT is extremely quiet. You can hardly hear it! It allows crew to sleep when they are off-watch. The rugged push-pull manual clutch permits almost instant engagement and disengagement. Two inexpensive shear pins will break in an overload and serious damage is prevented. The CPT drive box comes with a bracket for mounting to a bulkhead surface. For pedestal mounting, an optional stainless steel pedestal bracket is available for clamping directly to most pedestals. This bracket can usually be installed without drilling any holes. Two options, standard or shallow are available depending on the horizontal distance from the pedestal to the wheel. If pedestal mounting is not suitable, an optional L-shaped bracket for sidewall or cockpit sole mounting can be used instead. The power cord can be wired directly to the electrical control panel on the boat or hard wired directly to the 12-volt battery system (inline 10amp fuse provided). The control box is supplied with a clamp to fit the pedestal rail. It can also be mounted in other convenient locations as long as there is no magnetic disturbance. The use of versatile J-bolts allow a clean and easy installation of the wheel pulley to the wheel. Most of the time, the CPT is owner installed in just a few hours. The versatility of the CPT makes it easy to transfer from boat to boat which has made it popular with delivery skippers. When you take into account the cost of professional installation of an under deck pilot, the CPT provides a much less expensive option. Couple this with its rugged construction plus its ability to deliver more power, and it becomes the preferred choice over many smaller units. The cost may be marginally higher than other cockpit autopilots, but those units are not recommended for heavy blue water sailing. A CPT backup unit that consists only of the control and drive boxes is available at a reduced price (brackets, pulleys, etc are not included). Electronic heading sensor built into control box. The control box must be mounted away from steel and other magnetic influences. See “Checking for magnetic interference” for more information. * We prefer to call the CPT truly water resistant, as the term “waterproof” is often misunderstood. Storing the unit improperly for long periods in standing water or flooded conditions can eventually exceed the rating of the watertight seals.